Where could you use this? Here I am designing a pattern that need to use the fabric pattern repeat. That got to thinking that it would be great to do a tutorial on how to make these repeated blocks. Well there are many different quilts techniques that use them. 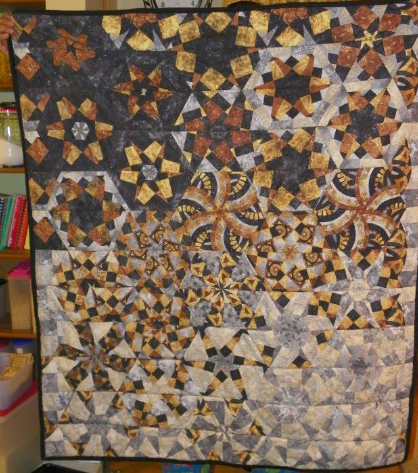 Some of the more popular are using The “Wack n Stack” method are”One Block Wonder”, “Kaleidoscope” and “4 Patch Posey” Quilts. These are a some that I have made in the past of each type. I’m drafting up the pattern for the 4 patch posey pattern so this will be posted later. How to make this is just a matter of deciding how many repeats you need and finding the pattern repeat of your fabric. 4 patch Posey has 4 repeats, One block wonder has 6 and Kaleidoscope has 8. First off finding a fabric with a large pattern is best when using this method. The larger the pattern the more interest and movement your quilt will have. When you have decided how big you need cut your strips to the with and the amount of how many you need. Example if I want 5″ squares to do a one block wonder I would find 6 repeats. For these fabrics, I would cut my strips at about 5 3/4″ so that I can get 2 strips per pattern repeat. Lay your Fabrics them one on top of the other with matching pattern. For this I like to use pins and choose a certain point in the design of the fabric place the pin vertically though each layer at the exact spot and do this in a few places to keep the fabric from moving when you cut the shape you need wether it be squares or triangles. One block wonder uses a 60 degree angle, the Kaleidoscope block uses 45 degree angle. and One block wonder uses 90 degree angle. If you wanted 12 wedges then you would use a 30 degree angle. just remember that the more pieces the bulkier the seams at the center where they meet will get. Using the degree lines on my 6×24 grid ruler I line up with the edge and cut the triangular shape. continue doing this by rotating the ruller to maximise the number of cuts per strip of stacked fabric. After cutting your shapes from your strips keep them together as these make a set for a block. This is where the fun part begins lay out your sets in the shape and start rotating them till you have a design you are happy with. the number of sides is the number of designs you can achieve by rotating the pieces. HAVE FUN…. This one was done with a Stonehenge panel… into a One block wonder. as seen above.